For many of us, the search for the true self begins and ends with God. Certainly this is true for author Michelle Prosser. In this remarkable book, Prosser opens up her life experiences to light the way for each of us as we undertake our own journey of self-discovery. There are many books available now that teach us how to use the Law of Attraction to bring into reality the life we really want. 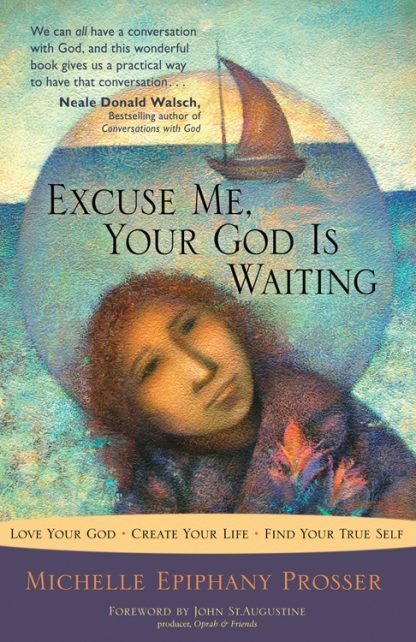 Excuse Me, Your God Is Waiting puts God front and center in the process and in our lives. We not only benefit from Prosser's many experiences but also from the numerous exercises she includes--exercises that allow us to get to know God, perhaps in a different way than we've ever experienced before. She shows us how to make God a part of each day, each experience, each trial, and each celebration. Michelle Epiphany Prosser, president of Energy Focus Coaching and Consulting, works with organizations and individuals to reach goals and manifest a better life. She is committed to deepening her spirituality and increasing self-awareness so that she can model to clients what she teaches. Michelle�s emphasis is on increasing focus and energy, improving communication, and identifying self-defeating behavior. Her message is we live the life we want not by DOING but by BEING. John St.Augustine has been called "the new voice of America" by veteran broadcaster Bill Kurtis and "the most influential voice on radio" by bestselling author Cheryl Richardson. His syndicated one-minute vignette, Powerthoughts!, airs daily on Oprah & Friends Radio and he is the senior producer behind Dr. Mehmet Oz's, Jean Chatzky's, and Bob Greene's shows, also on Oprah & Friends Radio. His previous book is Living an Uncommon Life: Essential Lessons from 21 Extraordinary People.